Yesterday I posted about a brief tinge of jealousy I experienced while spending an evening going through my friend Amanda's high school yearbooks. We graduated from the same school one year apart. And I only attended there my senior year. Although I missed the experience of building relationships while attending the same high school over 4 years, don't feel sorry for me! I wouldn't exchange my high school years (well, maybe some of 9th grade) for anything. And the relationships I built then are still with me. And where did I build those relationships if not at school? At church! For a relatively brief time (21 months total) I was enormously blessed to be part of a church youth group that not only changed my life, but still remains close today. Our friendships are special and have lasted over four decades. And we don't wait every ten years to have a reunion. Usually every two or three years we'll gather together. 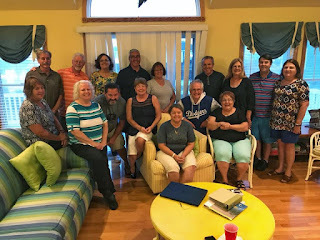 Last month Gail and I hosted a reunion of this group at our place on the Outer Banks. Some stayed for a week. Most were able to stay 2 or 3 days. Some had not seen one another since the 70's! And some had never met. They came from as far as California. Not all could make it, but all who could were glad they did! It was a fabulous time. So, yes, I wonder what it would have been like to have gone to the same school for four years. In reality, I truly only got to know a handful of my fellow graduates, and am in touch now with only one. Yet I don't feel at all deprived. My California church friends are as special to me as special can be. And there's no empty spaces in my heart. It's been way too long since my last post. Since October 1 I've been on a 3 month Sabbatical, a time of leave my church graciously gives me every seven years. Some might remember my last one in 2010 and the blog "40 Days in a Toyota" as Gail and traversed the vastness of these United States. Here's what's taken place thus far in this Sabbatical. 1. I realized I had to get away from home to get any real "rest". There are too many projects there. In fact, I bought a new chain saw that I've yet to use. And I know when I get home it will be the annual ritual of bringing down the Christmas decor from the attic...which really needs to be emptied. 2. Two days of fire training in Petersburg, VA. I was fortunate to hear iconic fire chief Alan Brunacini speak at this conference. Look him up. Quite the visionary and leader in the fire service. He died a week later. 3. The annual Federation of Fire Chaplains conference took me to Oklahoma City for a week. There I took training to be a certified instructor for the Federation, a two day class on a subject I can't even pronounce (theodicy), then the three days of training at the conference. 4. From OK City I flew to Colorado Springs and met Gail at the airport. With a rental car, we traveled west to Florissant, nestled in the historic Ute Pass. An old friend from high school days in Alexandria, Amanda and her husband Dave live on a hill top in the Florissant Valley with incredible views of the Rockies, including nearby Pikes Peak. They have a one room cabin on their property, complete with kitchen and bath, where we are staying. It is just what we both needed. We are indebted to this wonderful couple and their dog Earl. 5. While here in CO I have been working on two writing projects that are way overdue. You know how you start things but never finish? One is now finished and I'm praying for a publisher. It tells the story of Nags Head Church and how God allowed us to replant a church that was all but done. The second is a devotional book for teams, especially church staffs taken from Jesus' actions in the Gospel of Mark. It's about how He led without speaking. Maybe I can finish that one before January. 6. Our three weeks in Colorado end Wednesday. We've been able to see old friends, Homer and Mildred Wagoner and Pat Grob (from my youth days in CA), and lots of sights, both natural and man made, such as the Air Force Academy. I could live here. Other than the dryness that turns your nose into a blod clot machine, it's a great, laid back place. And no, I haven't been Rocky Mountain high, other than the drive up Pike's Peak, which was a one and done experience. 7. Had a bit of a bout of jealousy yesterday. I'm not the jealous type. But, Amanda allowed me to peruse her high school yearbooks. We went to the same church in our youth, and graduated from the same high school. But because of Dad's career I only went to Mt. Vernon High (Alexandria, VA) my senior year. She, however went to schools with the same kids from jr. high through graduation, and had all the year books. So, I went through them, looking at my class as they grew from 7th graders through the 11th grade. Amanda graduated a year before me, so that's where it stopped for the class of '73. But I have my senior yearbook at home. And going through those years with kids I barely knew it hit me that because I went to three high schools in four years, I missed out on what must have been a fun experience growing up with the same kids. I never really got into the school scene my senior year. You know, new kid on the block, senioritis, etc. Lots of things I wished I could have experienced, but didn't have the opportunity. Hence a bit of jealousy for those who spent 6 years of secondary school together. But, I'm grateful for the experiences I did have in those five different schools from 6th grade to graduation. The friends I made along the way helped me become me. And I wouldn't trade it. But sometimes I just wonder what it would have been like. More sight-seeing today. Then I'll be mid-way through this season of rest and work. Looking forward to the last chapter of my pastoral ministry and to a new chapter ahead of whatever God has for me. Maybe some more traveling. Maybe some high school reunions. You know, I could go to three 50 year reunions in 2023. I'm reminded (too frequently, it seems) that not everyone who listens to the teaching of God's Word (at least my teaching) gets it. Either by words or actions, I'm often baffled by behavior or sentiment that is clearly contradicted in Scripture. Jesus uttered these words on several occasions as He taught His disciples. "He who has ears to hear, let him hear", implying that hearing alone doesn't translate into comprehension. I expect that from new disciples. But I'm ever frustrated by mature believers who miss it. Then again, I'm sure the Lord has some similar frustrations with me. "Open our ears, Lord, and help us to listen." A former student of mine now writes for an online magazine. Days before the atrocities of domestic terrorism and racism she published this fine piece from her own experience. Well written, Tammy! I give you an A+. One of the lessons I've learned as a leader of God's people is this: If the vision isn't constantly and consistently shared you can't expect people to "get it". By that, I mean that no one just automatically grasps the "why" - the rhyme and the reason of what's behind "doing church" they way we do. If they don't "get it" I can't, as a leader really get upset with them for not being involved in ministry and mission. That is, unless they just refuse. Then I wonder a lot of things. At our church we have set the bar high when it comes to partners (members) being active (meaning consistent) participants in the multitude of ministries (service to our church) and missions (service to the world outside of our church). Behind that high bar are the clear teachings of Scripture about the giftedness and devotion taught by Christ and the Apostles. It really is inescapable! This morning a letter arrived addressed to me. No return address. No signature. Typically anonymous letters are critical in nature, and as such find their way into the circular file. But this was very different, and illustrates so well why Nags Head Church puts a premium on what we do as a church.